The new hybrids from Bobby Jones Golf are an interesting combination…the iconic brand Bobby Jones matched with the famous club designer Jesse Ortiz and I liked the looks of the prototypes even before hitting them. Four different Bobby Jones Black hybrids (18-, 21-, 25- and 30-degrees, $199 each) were used for this ten round test and in my mind that’s important though some might consider it overkill. However to give you concrete firsthand information for your purchasing decisions there’s no better way to understand a model line. From the start a couple of things were readily apparent and nothing subsequently changed that opinion. Blacks hit the ball a long way and hit it great from almost any lie, so without recounting every shot over all ten rounds here are examples of what I experienced time and again. A par-3 of around 180-yards, depending on pin and tee marker locations, is normally a stock 4-iron figuring it will land about 5-yards short of the pin and release towards the hole. Playing it the first time with the Bobby Jones Blacks I took out the 25-degree and swung away hitting a nice straight shot that hit and released about five-yards. The only problem was the spot it hit was 10-yards past the pin so the ball finished off the back edge of the green. Let’s be clear, I’m not saying every swing with each of the Blacks was 15-yards longer than the iron they replaced. However they definitely are longer and in part at least it’s from developing confidence/trust in a club. 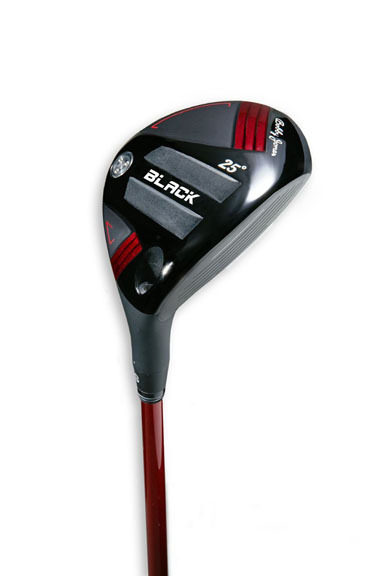 Hybrids in general and these in particular are more forgiving than the comparable long iron so once you hit a few good shots with the Blacks the more confident you become. Confidence is a wonderful thing since it feeds on itself and grows which is exactly what I experienced with the Blacks. During one of the early rounds one of my offline tee shots bounced into a stand of 80-foot oaks (and since I live in Florida, complete with Spanish moss) finishing in a patch of rough the mowers must have missed at least all winter. Usually this shot, 160-yards under tree limbs from thick high Bermuda, would have been a choked-to-the-metal 3-iron back in my stance and punched as low as possible hoping it would run somewhere near the green. Not having a 3-iron but having the 21-degree Black I tried the same shot and the ball came out very cleanly, scooting to the front edge. I didn’t make a par but then my tribulations around the greens is another story. Out of the rough (without having to contend with tree limbs) one less club worked well in most every instance generally providing adequate compensation for an inadequate tee shot. Finally, did I mention the Bobby Jones Blacks hit it high—higher than the corresponding iron? From just about every lie I got my ball into? Again, this is really a help for one’s confidence which in turn makes the next time you hit them even easier. The combination of more distance, more height and more control will keep the Bobby Jones Blacks in my arsenal for a long, long time. Want another measure of how much I like them? I have recommended them to three friends and a potential son-in-law…now that’s really going out on a limb. Images courtesy of Bobby Jones Golf.